Courageous Quinn was so full of personality! She let her family know her so well in her brief time with them. Just like her momma Meghan, she was strong and impressed us all with her determination! Meghan tells Quinn's story in this continuation of our series about 13 babies with Trisomy 13. I share my life with my husband Steve, our oldest daughter, Ashlyn Grace (3.5), and our rainbow baby, Adley Mae (1). Quinn Elise. Just thinking about her makes me smile. She was beautiful! Born on 11/28/11 at 5:03 pm. She was so strong and loved to break the rules! They say that Trisomy babies are small and typically stop growing at 7.5 month gestation, not Quinney. Quinn was born at 39 weeks 0 days and was 9 pounds 13 ounces! 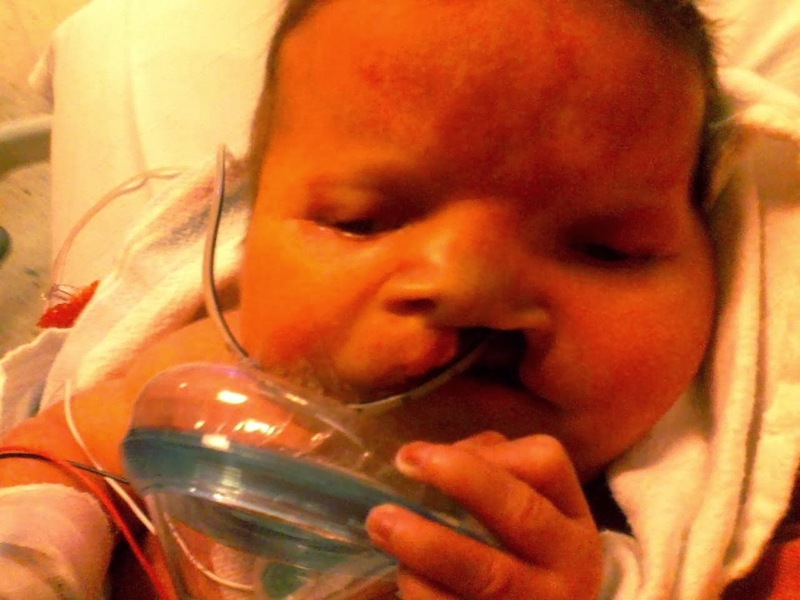 She was born breathing on her own and other than blow-by oxygen was never on any type of life support. Quinn was born with Full Trisomy 13; she had a bi-lateral clef lip and palette, Dandy Walker cyst, and a giant omphalocele that included her liver. She also had so much hair and looked just like her daddy. She had such a little personality and would let you know when she didn't like something. She also had the sweetest little squeaks. When I was pregnant with Quinn and we had just learned of her diagnosis, I asked the doctor if she would suffer once she was born. He told me that they weren't even sure that "these babies" even have enough brain activity to feel pain. Well Doctor, my daughter sure could and did let us know when she was in pain, mad, needed a diaper change, was hungry, etc., so I would like everyone to know that these babies do most certainly have enough brain activity to not only feel pain and emotions but to feel all of the love that is poured over them in their all too short lives. 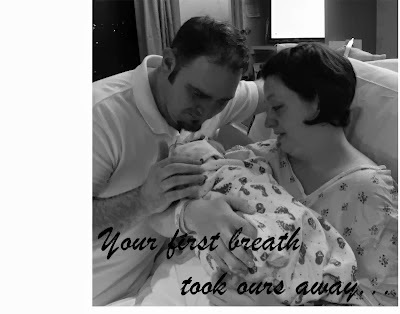 Quinn died in my arms at 4 days old of respiratory failure. Steve and I chose to not intubate because we did not want her to suffer later. The Dandy Walker cyst was at the base of her brain and eventually, spinal fluid would have backed up in her skull. With the giant omphalocele there was no way to shunt the fluid except to her heart and this was not something that we would do to her. From the day we found out about Quinn's T13 diagnosis, we said that we would never do anything to her, only for her. We would not be selfish and do something that would keep her here just for us. So that night, December 2, 2011, I kept my promise to her and held her as she took her final breaths. When I was pregnant with our first, Ashlyn, and we had our NT Scan, I was a nervous wreck until I found out the results! I called the office on a Friday afternoon and made them tell me because I couldn't wait the weekend. Things are so different with your second! I just assumed that since the first pregnancy was perfect that this one would be as well! I actually had to do the NT Scan twice with Quinn. The first time they couldn't get the measurements they needed so I went back a week or so later. Still, it never occurred to me to be worried about it at all. I got the call on 6/5/11, the day after Ashlyn's 1st birthday party. I was at my Mom's house visiting with my sister who was in town and got a call on my cell. It was the nurse that asked me to hold for the doctor.... nothing good ever comes out having to wait for the doctor. The doctor got on the phone and informed me that we had increased odds for Down Syndrome, 1 in 136. We were not at increased odds for other Trisomies at that time, so we were told. We were offered an Amnio at that time which we declined and decided that we would instead have a Level II ultrasound at our 20 week scan. The day of our 20 week scan, July 20th, came and really, I wasn't that nervous. I knew we had the chance of our baby having Down but honestly, I wasn't that worried. We could deal with that! Of course our life plan would change some but I was OK with it! The evening of the scan we had plans for all of our friends and family to come over and we would all find out the gender together. I had the cake ordered, everything! The scan seemed to go well. The tech had a hard time getting the gender but never once did anything seem like there was anything wrong. Finally she could see the gender, told us she got it and would seal it in an envelope. She left the office and returned with 2 envelopes, one for us to open later after the party and one for the baker to finish the cake. A few minutes later the Doctor came in to finish the scan. He came in, put the wand on my belly and just watched the screen for a bit.... then came the words that made my world come crashing down, "I am seeing genetic defects here". I said, "OK, it's Down", he gave me a very sad look and told me that no, it wasn't Down. They ushered us out a back door and said that they would call with the amnio results. I was then left with having to call family and tell them to not come to my house that night. We had the scan on Wednesday, Monday we got the call from the Doctor that confirmed that our daughter had Trisomy 13. Quinn's birth was wonderful! I was so very blessed to have VERY supportive medical personnel on my side! I fought to stay with the midwife group in my doctor's office rather than going with the high-risk doctor. More than anything, I knew that I would need the support of the midwife through the delivery. Our plan for delivery was to monitor Quinn's heart tracing very closely and should she ever be in distress I would instantly have an emergency c-section, however, for as long as she tolerated labor I would attempt a vaginal delivery. I had multiple meetings with many different doctors including the NICU doctors, I was very impressed that doctor in charge of the NICU the day that Quinn was to be born even came over to talk with Steve and I about our birth plan and what we wished for Quinn once she was born alive. After discussing with my midwife and the doctors we decided that I would be induced at 39 weeks. This way, we could be as prepared as possible. All necessary medical staff could be on hand and vaginal or c-section, I would deliver in the O.R. which is attached to the resuscitation room. The morning 11/28/11, we dropped Ashlyn off with her sitter, my best-friend, and headed to the hospital. A lot of our family actually beat us there. I was hooked up to the pitocin and then got my epidural very early so that I would already have it in case Quinn went into distress. I spent the next 7 hours or so just hanging out with family. Quinn's heart tracing was great! They had discussed breaking my water to move things along a bit and then the next time that they checked me Quinn broke it for us. She kicked the hardest kick I had ever felt, scaring all of us because she hit right where I had a monitor on my belly, and at the same time broke my water which actually made my mid-wife have to go change, lol. I carry A LOT of water! My girls like swimming pools in there! Finally the time came where I felt like I needed to push. I was moved to the O.R. and was as scared as I have ever been in my life. The only thing that kept me calm was hearing the little digs of her heartbeat from the internal monitor. I pushed and things went fast and really well. At one point I didn't hear the dings anymore and freaked out! They told me she was out, well almost out, so I wouldn't hear them anymore. One more push and she was completely out. I had pushed for right around 10 minutes. They laid her on my belly just to cut the cord and I saw her beautiful face, she let out a little squeak cry, and grabbed my finger. The happiest moment of my life! My baby was alive!!! It was all I had dreamed of for 19 weeks since hearing the diagnosis! They took her to the resuscitation room and then moved me back to the recovery room. Our entire families came back to my room and we are lucky enough that Steve's cousin, a priest, was able to be there for us. They brought Quinn into us before she was transported to Children's Hospital and we were able to have her baptized in the room surrounded by our entire family. It was a beautiful wonderful moment! How long did Quinn live? Quinn spent her entire life in the NICU. The nurses and staff were wonderful and we were able to hold her anytime we wanted. I was able to pump for her and feed via feeding tube. We were able to to be with her as much as we wanted. I do, at times, have guilt that I ever left her side. That I ever tried to keep life somewhat normal for Ashlyn, our older daughter. There will always be guilt but that is for another time. The time that I was with her was beautiful. Her little squeaks that she would make when she was happy. She sounded like a little cat when she would cry when she was mad or hungry. We did not choose any medical intervention for Quinn when she was alive. She was assessed and had an MRI but other than that, the only intervention she had was oxygen that was pumped into her isolette or on blow-by when we were holding her. When we knew that we were coming to the end, we decided against intubating. Quinn had a Dandy-Walker at the base of her skull, eventually, spinal fluid would back up in skull. Due to the omphalocele on her belly, there was no way to shunt that fluid. It seemed better to us to let her go without medical intervention before that fluid started to back up and would cause her to suffer. She died of respiratory failure, she was on adavan and morphine to be kept comfortable while she took her last breaths. It is funny how your perspective changes after everything is said and done. While I was pregnant and trying to plan for her death I thought that I wanted her cremated. Once she was born and then died, I couldn't do it. I could not imagine hurting a single hair on her head. At that point we decided on a full funeral and burial. She had a beautiful white casket which we had open for the Calling Hours. She looked like just a perfect little doll. We displayed pictures on a Christmas tree at the funeral home, and she had a lot of little mementos with her in the casket - enough that we had to leave some out. She had her mini-pink boxing gloves and her Cleveland Browns Quinn jersey displayed with her casket as well. During the service we had the book "On the night you were born" read and it was so perfect. Besides being the first book that we read to her it was just so fitting and beautiful. Steve and I went ahead and bought 2 plots and we will be buried along side of her when our time comes. We are blessed where we live that we have an organization called Memorials for Angels, and they donated Quinn's headstone to us. Our families were VERY supportive of our decisions. My family helped us pay for the funeral home. We were also lucky that an Aunt in Steve's family had cemetery plots that they no longer needed (they had got a family mausoleum instead) and we were able to purchase those for a much lower amount. Our family and friends were amazing at the calling hours and funeral to help support us and our choices for Quinn. Steve's cousin is a priest, he was at Quinn's birth and death, and he handled the funeral for us. We are very blessed to have such wonderful friends and family. Quinn died 12/2/11, it has a little over 2 years since I held her and my arms still ache every day for her. Honestly, I don't know. There are days I feel fine and there are days where I think of her and I feel like my soul is being ripped out of my body. I am not sure I have ever fully allowed myself to grieve completely. Everyone grieves differently. You and your spouse both lost your child but it will hit you in VERY different ways and at different times. Do not expect them to feel the same as you do and do not expect them to know how to comfort you. There is a very good chance that they will be unable to comfort you at all as they are lost in their own grief. Also, try to find a support group. I am so so very lucky that I found a group and went to my first meeting just a month after Quinn died. Once a month, I get to go and parent Quinn. I get to tell her story and say her name without having to worry about making anyone uncomfortable for talking about my dead daughter. The people there understand what I have went threw and are going threw it along with me and it is a powerful thing to know that I am not alone, there are those out there who know what it is like to have a part of themselves missing. Meghan, you have such a way with words! You said so many things that I've thought over and over! Thank you! Meghan, thank you for sharing your beautiful and precious Quinn with us. Meghan, you are so strong. I am so greatful and blessed to have known your story and be touched by Quinn. She has helped me heal. Thank you for being strong yet again and sharing your story here. I have already pointed a friend to this blog who just got the diagnosis today that her sweet baby has T13.